Hair extensions can completely transform your look. The beauty industry now offers a variety of types and application methods. The process may be intimidating for women who have never worn extensions before. Knowing what to expect can help you decide if this beauty treatment will work for you. What Type of Hair Extension Should I Wear? You should have an understanding of the different types of hair extensions before you have them put in. There are several available, each with its own set of pros and cons. Tape-In Hair Extensions – This type uses tape or adhesive to affix to your natural locks. A stylist will align each extension so that the base sits at the root of your hair during the first appointment. Follow up appointments will be necessary to move the extension up as your real hair grows. Quality extensions can usually be re-used. Tape-in extensions can last between four and eight weeks before reapplication is needed. Sew-In Hair Extensions – Sew-in hair extensions, or weaves, are sewn in. Your stylist will begin by braiding your real strands into a tight cornrow. The extensions are attached to the braided rows using a needle and thread. This process can take several hours. Tension and weight from the braids and extensions can cause some discomfort. Only a professional should apply sewn-in extensions. This type is not suited for women with thin hair. Sew-ins can last for six to eight weeks with a maximum wear time of four months for a full weave. Pre-Bonded & Fusion Extensions – This category uses glue to hold extensions in place. A machine that resembles a hot glue gun is used by your stylist to apply the extension to your real strands. The pre-bonded version uses a heat clamp to melt the glue instead. Both types require repositioning once every two to three months. Chemicals used to make the glue could cause some hair damage or scalp irritation. Talk to your stylist if you have any questions or concerns. Micro Link Hair Extensions – Micro link extensions are applied using small beads or loops that attach to your real hair. They are clamped down with a tool or heat to prevent sliding. Each extension is connected to small sections of hair and takes around three hours to finish. Micro links will need to be repositioned once every two to three months. Clip-in Hair Extensions – Clip-in hair extensions are the easiest option, especially for people who prefer the DIY method. They use small clips to attach to hair. They are often used to experiment with highlights without committing to dying real hair. What Kind of Hair is Used to Make Extensions? You will have the choice of either synthetic or real human hair when picking out an extension. The price will vary based on quality, thickness, and length. Remy human hair is the most desirable because of its superior quality. It is also the most expensive option, usually costing several hundred dollars or more. Synthetic hair usually runs between $50 and $100. While it can look good, it is more difficult to blend naturally with real human hair. It also may not be able to be styled the same way. Many women will choose synthetic hair to try on bangs or a different look before deciding to commit. Can I Color, Cut, and Style My Hair Extensions? Once your extensions are applied, your stylist can cut and style your hair. This is usually recommended to achieve the look you are going for. 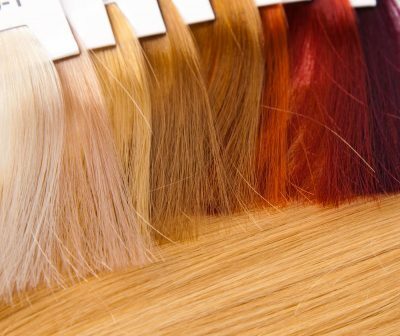 Human hair extensions can also be dyed. It is best to choose an extension that matches your current hair color or whatever color you plan to wear long-term. Multiple applications may be needed when lightening extension hair. Synthetic hair is usually made of polyester, acrylic, and nylon, which won’t respond to dye the same way that human hair does. You should consult your stylist if you want to change the color of synthetic extensions. Know what to expect when you go in for your first hair extension appointment. That includes the estimated time it will take to finish application. There are estimates available online, but you should always consult your stylist for a more accurate timeframe. You can wash your hair with a clarifying shampoo before your appointment, but do not apply any conditioner or other products to it before you go in. These could affect the extension’s ability to adhere. Also, make sure you have all the tools and products you will need to take care of your extensions. An extension brush and dry shampoo are a good start. Your stylist can provide product recommendations to help keep your extensions in place for as long as possible. If you have questions or are ready to make your first hair extension appointment, talk to an expert. Tiffany Taylor is available now to help you make the right choice for your hair.